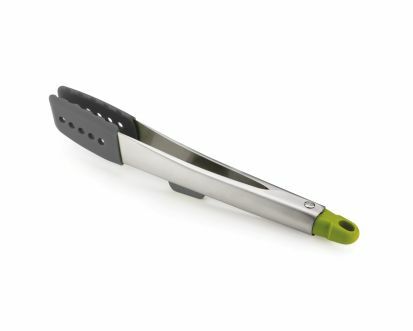 The Joseph Joseph Elevate™ Steel Tongs are made from stainless steel and feature heat resistant silicone heads. The jaws are springloaded , can be locked and unlocked easily via mechanism on the end of the handle. The silicone heads are perfect for use with non-stick cookware and are heat resistant up to 270ºC/520ºF. The tongs are dishwasher safe.